Small blue drakes that fire heavy lightning blasts and have fairly high health. 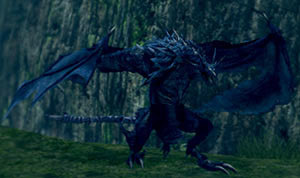 A total of six drakes can be found near the bridge from Darkroot Basin elevator to lower New Londo Ruins. In melee range, the drake performs a quick bite attack that deals a lot of damage. Performs a jump forward to catch up to the player. Poison - aim poison arrows at the very tip of the Drake's head. An accurate shot will be confirm each hit with the cry of pain that they typically let out after several consecutive hits. The third arrow the poison drain will begin. Bleed - the drakes are susceptible to bleed build-up from bleed inflicting weapons. Fire, NOT Lightning; they have very high Lightning defense but average Fire defense. Large Swords can stun Drakes, if they hit hard enough. 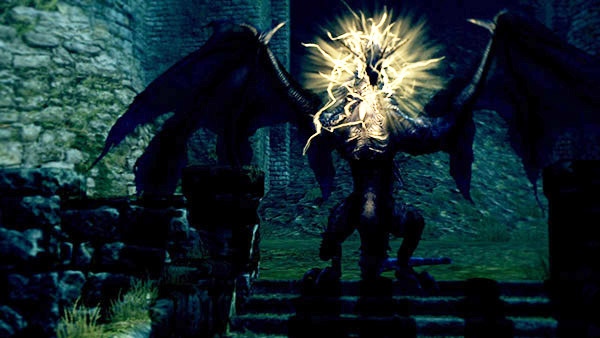 Drakes have high Poise, but it isn't infinite. Can be stunned through consecutive attacks, leaving them open for a riposte. Use the Jagged Ghost Blade and get behind them. Then hit them with your strong attack quickly. When fighting near the ravine, there is a good chance that they will take a leap back and fall to their death. Curved greatswords like the Gravelord Sword makes quick work of Drakes because it takes very few light attacks to break their poise and stun them. Go from the left side, attack them until they're stunned. As the Drake is stunned, move a little bit more to the left, letting your stamina recover a bit and get to a safer area. Rinse and repeat. If you're a Sorcerer (or have decent Int and the right spells) you can effortlessly kill Drakes from very early on in the game simply by using Heavy Soul Arrow and/or Great Heavy Soul Arrow on them as both spells will allow you to stun-lock the Drakes; each spell stuns them on impact, and the stun duration is just long enough for you to fire another spell before they are able to fire their breath attack - however I suggest taking a couple steps backwards as you begin to cast the spell to give yourself some extra time since the Drake's AI will make it start to walk towards you to get in range before it tries to use its breath attack. On average, depending on your Intelligence, you can kill a Drake with only 3-4 casts of Great Heavy Soul Arrow or with 4-5 casts of Heavy Soul Arrow. The Lifehunt Scythe works very well against the drakes. It's a good idea to bait their lightning breath, then run towards them (while avoiding the lightning) and hit them with a running attack, because the standard attack is very slow. You take away half their health every time you bleed them. Check the Upgrade Material Farming page for more info on how to farm Dragon Scales. Drakes that fall through the map can sometimes be found within The Abyss, with all drops still intact.